He says one cannot just spend huge public money and leave. 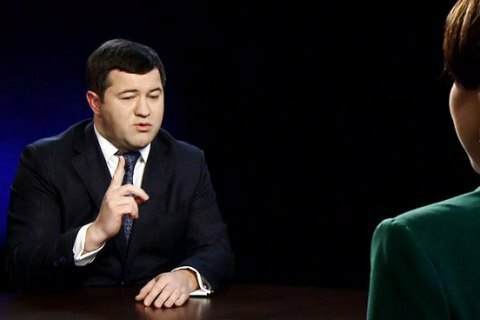 The State Fiscal Service (SFS) will not dismiss Odesa customs chief Yuliya Marushevska until she gives full account of her work and does a handover, SFS chief Roman Nasirov has said in an interview with Sonya Koshkina's Left Bank TV talk show. "In her statement she requests resignation upon mutual consent between the parties. This is news to me because there is no SFS consent. If a person wants to leave, she or he must do so of their own will. Not pull a trick to later register with the employment office and receive an unemployment benefit. Dismissal upon mutual consent between the parties must happen the same day (a resignation letter is tendered – ed.note), which is, pardon me, unacceptable. Wherever a person holds a responsible post – either with a private firm or public office – any issue of hire or dismissal must be approached in a very serious manner. For us, the handover of cases and projects, which may have been initiated but not completed, is important; it is important that the person report on their work and on the current situation," Nasirov said. He denied reports that Marushevska was suspended. "She has neither been suspended nor dismissed to date. Since she simply did not show up for work, there was no other way but to appoint an acting chief. If she reports to her workplace, we will discuss this issue. If she still wants to leave, she is welcome: work for two week, as the code requires, and do a handover," the SFS said. He said he could not agree with how Mikheil Saakashvili's so-called "Georgian team" sees the situation with achievements at the Odesa customs. "Out of 25 regions, Odesa is No 21, the fourth one from the end in terms of implemented tasks. Although the share of the Odessa customs in filling the budget is not so big, around 6-6.5 per cent. And while others ensure a 15-per-cent surplus of receipts on average, Odesa falls around 8 per cent short of the target. This is the first problem. The second one concerns faster customs clearance. In terms of the time it takes to clear both imports and exports, Odesa seats 15-20, compared with other regions. The number of customs examinations has decreased across entire Ukraine, that is a fact. But Odesa is not even among the top 10 performers, if you look at regional statistics," Nasirov said. He also denied Marushevska's statement that 650 companies now officially clear their goods at the Odesa customs. In his words, there is no proof of this because an analysis is only being prepared and the volumes of cleared cargo have not increased. He regretted that the process launched by the Georgian team in Odesa had not been completed. "That is why it is important to sort out the transfer of cases [by Marushevska]. One cannot just spend huge public money and leave," he concluded. "Visa-free travel is not an issue of Ukraine but the EU and the whole world"
Rodolfo Amoresano: "Investment funds looking at Ukraine ready to take high risks"